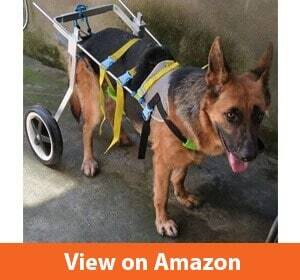 If your dog is in the need of a wheelchair, you would do what you can to get them the best dog wheelchair available! If a pet loses their ability to walk or run, nor will it be hard on them, it will also be hard on the dog owner. It is very heartbreaking to see your pet deal with this issue, without being possible to make it all go away. However, dog wheelchairs will give you and your pet a bit of an aid, as they will allow the pets to go on with their daily activities again! This wheelchair will assist your beloved one, by providing rear leg support. The leg support consists of a neoprene rear harness, which allows the dog to feel more comfortable moving around with it. At the same time, it will provide your pet with the needed freedom to walk and run! To help carry the weight of this wheelchair, padded shoulder support has been implemented and it can be adjusted, based on the size of the dog. The wheels of this wheelchair are all-terrain pneumatic ones, combined with bearings that are waterproof. This allows the dog to have a steady, smooth ride. 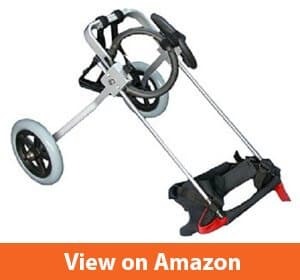 This wheelchair can be used in cases where assistance with walking is necessary, as well as full rear leg support without any weight bearing in the rear legs of the dog. It allows bathroom use, without being a bother at all. There are many conditions, in which your dog might require this kind of assistance, such as: hip dysplasia, arthritis, fractured spine or back, rear amputation, injury or a problem due to the nerves. One thing many might wonder is what this wheelchair will allow your dog to and what not. While your dog might stand in place, walk and run with it, it will be impossible for them to sit while using this wheelchair and for sitting, it should be removed first. This wheelchair type is ideal for larger dogs, who weigh up to 180 lbs. It provides with rear leg support, allowing pets with disabilities to gain their motion back. 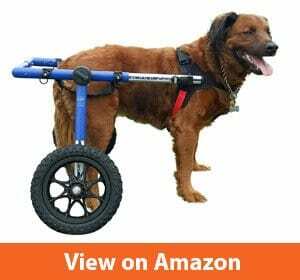 It is either suitable for dogs who may still have motion in the rear legs but need assistance, or for dogs who have lost total control over the rear legs and need full assistance. In length, this wheelchair is made for dogs who are 17-20 inches long. It can be easily adjusted to fit dogs within that range. In fact, its length, width, and height can be adjusted as simple as by only pushing a button. It is believed to be the easiest wheelchair to adjust. Its frame is made out of durable aluminum, which will not bother the per in any way and although it is extremely durable, this doesn´t mean that it won´t allow your dog to move freely around while carrying it. The hardness of the wheelchair can be completely adjusted while providing with additional support. The wheels of this wheelchair are suitable for all terrains, as its material is not one to tear. These are dense, foam wheels that have rubber treads and you shouldn´t worry if your dog enters a terrain that seems to be not as smooth. This wheelchair comes in seven different sizes and you can choose the right size by comparing it to the length and width of your dog. The size L of this type of wheelchairs is made for dogs who are 10-15 inches wide and 20 to 24 inches high. As of weight, the dogs should be between 44 and 110 lbs heavy. This is a type of wheelchair that is more meant for older dogs who have completely lost motion over their rear legs. It provides with full support and pets with disabilities can get a big advantage by using this wheelchair, as it provides them with the lost motion ability. The frame of the wheelchair is made out of aluminum, a durable yet lightweight material that best allows for your dog to feel free and walk and run while carrying the wheelchair. The length, height, and width of this product can be adjusted. All in all, it provides for comfort and your pet will quickly get used to it. It is important for you to check this wheelchair at about once a month, to make sure that all the walking and running hasn´t loosened up any screws. Your pet will be able to relieve himself while still having this wheelchair on. Sitting won´t be possible and you need to remove the wheelchair for your dog to be able to sit. This wheelchair is made for dogs who are bigger in size and heavier in weight. Dogs up to 180 lbs can fit in this wheelchair and move freely around while carrying it. Legs of the dog shouldn´t pass a limit of 21-22 inches, otherwise, the wheelchair might not fit. 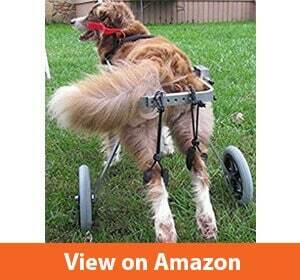 It is a great rear leg support, providing your disabled pet with the fullest comfort. The frame of this wheelchair is made out of aluminum, a durable material, that is however very lightweight. 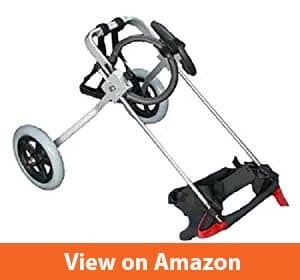 Your pet will find it easy to maneuver, but keep stable this rear leg support wheelchair. The harness of the wheelchair can be adjusted so that you can find just the right distance that is best for your pet. Veterinarians approve of this wheelchair and find it to be very helpful for dogs who have lost the ability to move their rear legs, or need assistance when doing so. The wheels of the wheelchair have also been made out of durable material, that is guaranteed not to puncture. 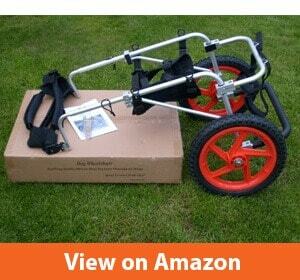 This is important, as it will allow your pet to reach any terrain they want, without damaging the wheelchair. Using the bathroom will be possible for dogs while keeping the wheelchair on. It is still important to attend your pet at all times while they are using the wheelchair. This small wheelchair is made for dogs of smaller size, from 8 to 11 inches. When measuring your dog to make sure it fits, it is important to know how to measure them. Without measuring your pet properly, you might be looking at a wrong-sized wheelchair. Your pet should be measured from the floor to the top of the dogs back. Also, this should be done while the dog is standing, and not sitting or lying around. As the wheelchair will be used in a standing position, it is important to gather these measurements in that same way. The wheelchair is really easy and quick to assemble. Its frames are made out of aluminum. They are adjustable and lightweight, with aluminum guaranteeing that they won´t rust with time. The hardware of the wheelchair is also non-rust and stainless. The front and rear harness are neoprene, which provides with the fullest comfort to your loved one. This wheelchair type is stationary, which means that your dog will only be able to use it while in a standing position. Sitting won´t be possible while still having this wheelchair on. Using the bathroom will also be possible and for this case, it is recommended to have the tail above the wheelchair and not below it. 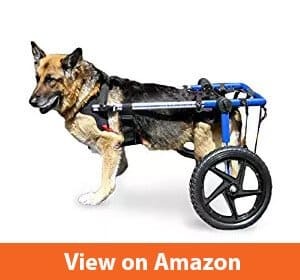 This is a great wheelchair that veterinarians recommend when your dog has lost the ability to move the rear legs or needs assistance, as they might be unable to move only on their own. This wheelchair is made especially for dogs of medium size, who weigh from 40 to around 60 lbs. When measuring the height of the dog, you should start measuring from the floor to the dog´s back. If the height is between 16 and 20 inches, then this wheelchair will be the right fit for you and your pet. This type of wheelchair also comes in 7 other sizes; therefore, it is important to make the measurements correctly and make sure that you are choosing the right one. The frame of this wheelchair is made out of aluminum. While the frame is extremely durable and won´t rust, it is also lightweight and gives your dog the needed comfort to be able to move around without feeling bothered. The hardness of the wheelchair is also adjustable, which is an important feature when it comes to additional comfort. Without this adjustment, the comfort of the dog would only be limited. It is important to make sure that all the screws of the wheelchair are tight and they should be checked for this after using at least once a month. As the dog will be using the wheelchair to walk a lot and run around, with time screws can loosen up, however tightening them back is a quick procedure and it is easy as well. This extra small dog wheelchair is suitable for the smallest loved ones, that need assistance due to an inability to move their rear legs fully, or up to a limited amount. Its frame is made out of a lightweight material, that is however extremely durable. The aluminum frames are not only durable, but they are also rust-free. The front and rear harnesses are neoprene and very easy to adjust to the needs of your dog. The hex wrench is there to allow for an easy adjustment of height, length, and width. When in the wheelchair, the pets will be able to use the bathroom. It is designed for both female and male pets to be able to freely relive themselves. Also, this wheelchair is designed to withstand any type of terrain, as its wheels are made out of polyurethane and consist of sealed bearings. This wheelchair is recommended by veterinarians in cases of hip dysplasia, arthritis, neurological problems, rear limb amputee, lumbar disc injury, a fractured spine, and many other conditions due to which your pet might lose full control over the rear legs or have weakened legs, that no longer allow for free movement. This wheelchair has been specifically designed by orthopedic surgeons to provide with all needs a disabled pet might have. Choosing the best possible wheelchair is not an easy task, as pet owners always want to make sure their pet is getting the best product available. When it comes to pets, we try and get everything that they might need. Pets with disabilities need even more of this care. Apart from wheelchairs, there are specific orthopedic dog beds, recommended in cases of injuries. Warm dog beds are also helpful towards the healing process. If your dog has lost the ability to move, you will try and inform yourself on what neutralizes dog urine as well. The best dog wheelchair is the one that will be perfect in size to fit the size of your dog. If your dog isn´t comfortable in it, it won´t make any difference how durable the wheelchair is. The most important criteria is that it fits perfectly and allows your dog to freely move.